안동역 구내에 있는 탑으로, 전탑의 형태를 띠고 있다. 안동 지방에는 다른 지방에서는 볼 수 없는 전탑이 다소 있는데, 전탑이란 흙으로 구운 벽돌로 쌓은 탑을 이른다. 탑은 무늬없는 벽돌로 5층을 쌓았다. 몸돌에는 층마다 불상을 모시기 위한 방인 감실(龕室)을 설치했고 특히 2층 남쪽면에는 2구의 인왕상(仁王像)을 새겨두었다. 지붕돌은 벽돌을 사용한 것에서 오는 제약때문에 처마 너비가 일반 석탑에 비해 매우 짧다. 밑면의 받침수는 1층부터 차례로 10단·8단·6단·4단·3단으로 줄어들었고 처마끝에는 기와골을 받기 위해 총총한 나무를 얹고 4층까지 기와를 입혀 놓았다. 이러한 지붕모양은 탑신의 감실과 더불어 목탑양식의 흔적을 보여준다. 탑의 꼭대기에는 머리 장식으로 복발(覆鉢:엎어놓은 그릇모양의 장식)만 남아 있다. 이 전탑은 통일신라시대의 탑으로,『동국여지승람』이나『영가지(永嘉誌)』에 기록된 법림사(法林寺)의 전탑으로 추정된다.『영가지』에 법림사전탑이 7층이라는 점, 조선시대에 크게 보수를 하였다는 점, 탑의 머리장식은 법흥사탑(法興寺塔)과 같이 금동제였으나 임진왜란 직후 명나라 군인들이 도둑질해 갔다는 사실 등이 기록되어 있는 점으로 보아 지금의 모습과는 큰 차이가 있었을 것으로 짐작된다. 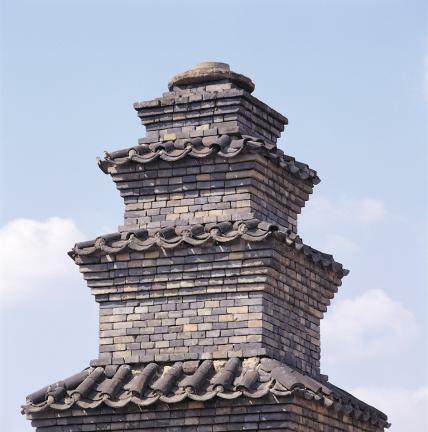 This five-story brick pagoda is located in the vicinity of Andong Station. 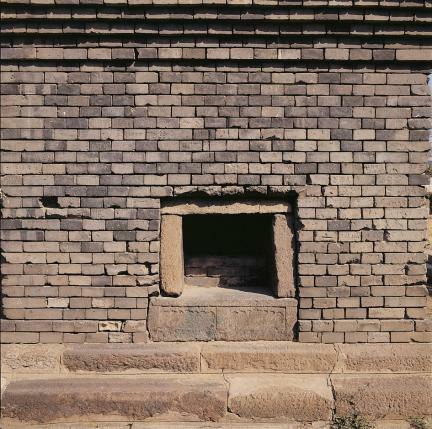 Andong province contains a number of unique brick pagodas (built with the earthen bricks) of a kind rarely found in other areas. 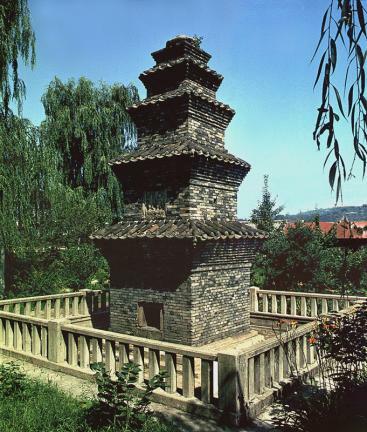 The main body of this five-story pagoda was built with pattern-less bricks. 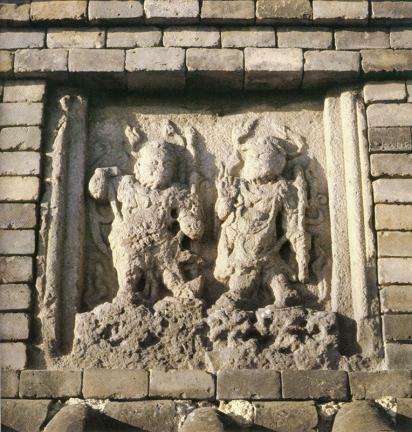 Every story has a niche for housing a statue of the Buddha, with the southern side of the second story housing two temple guardians. 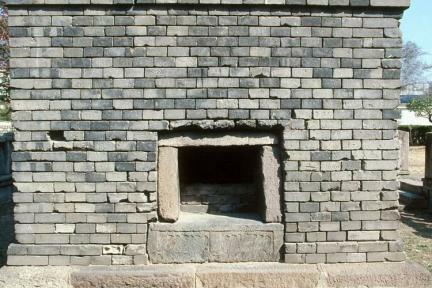 The width of the eaves is much shorter than that of stone pagodas due to the use of bricks. The number of base plates for the roof falls from ten in the first story, to eight, six, four and finally three in the other stories. 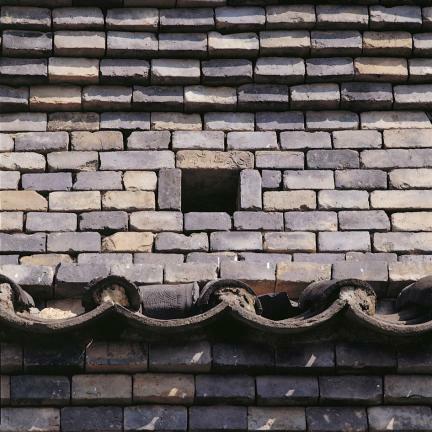 The supporting tiles along the edge of eaves are made of wood. The fourth story has a tiled roof. 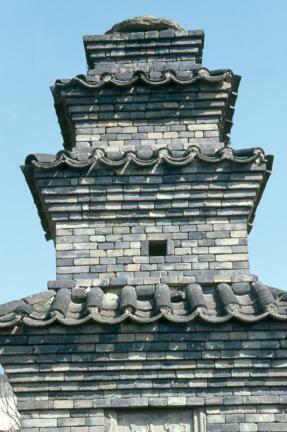 This sort of roof design complete with niches originates from wooden pagodas. 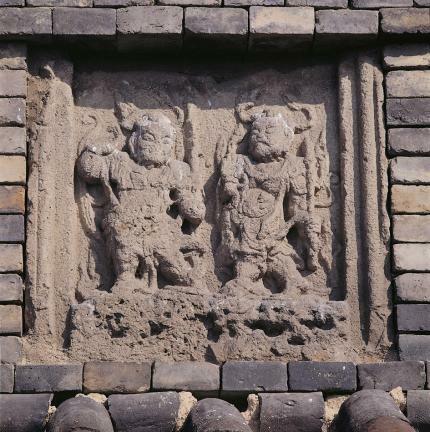 On the top, only a stone shaped like an over-turned bowl to support the top ornament remains. 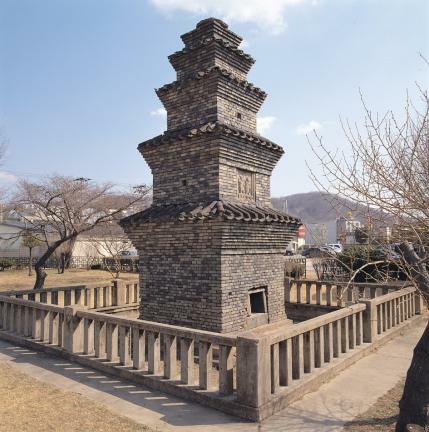 This brick pagoda, believed to be the one at Beomnimsa Temple mentioned in the record written in Dongguk yeoji seungnam (Augumented Survey of the Geography of Korea, 1481) and Yeonggaji (Record of the Andong Region, 1608), was erected in the Unified Silla Period (668-935). 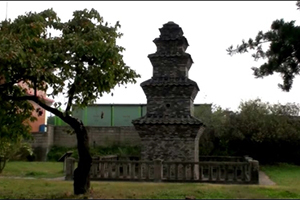 Historians presume that the actual pagoda differs greatly from the original one, as Yeonggaji records that the brick pagoda at Beomnimsa Temple was a seven-story structure, and because it underwent major repair work during the Joseon Dynasty (1392-1910). 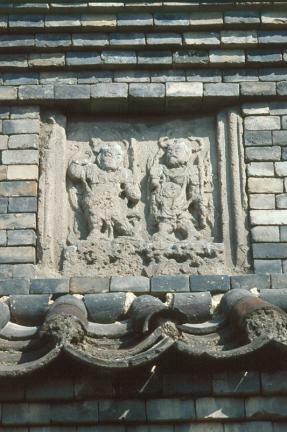 The record also states that its gilt bronze finial, like the top ornament of Beopheungsa Temple, was stolen by soldiers of the Ming Dynasty right after the Japanese invasion of Korea of 1592-98.